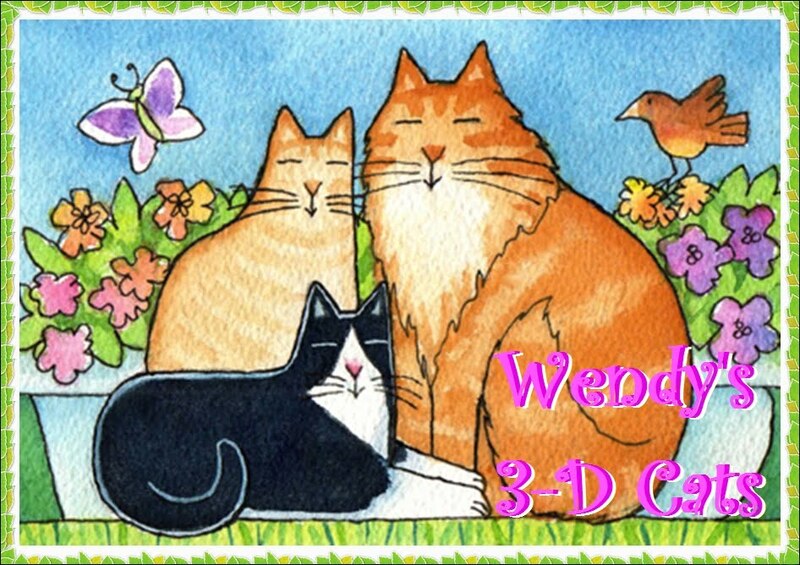 Wendy's 3-D Cats: 3-D CATS IN CANADA DAY HATS! Today, July 1st, is Canada Day when we celebrate the birth of our country and all things Canadian. Each of the 3-Ds is out there waving the Canadian flag and paying homage to some of our native animals (other than themselves, of course). Dante's all hatted up in a red and white top hat with Canadian maple leaves. He has a matching red-and-white striped bowtie and Lacoste watch. 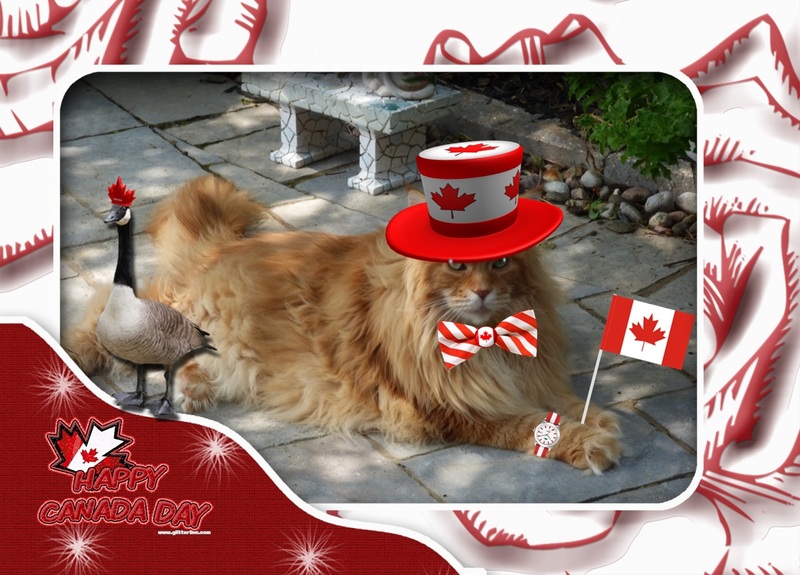 His friend, the Canada goose, is also sporting a Canada Day hat -- a red maple leaf that fits his little head purrfectly. However, once he decides to take off the hat gets left behind. He sure made a big enough flap about it! "Take a gandah at dat!" says Dante admiringly of the Canada Goose fly-by. "Wot a show!" Dylan's wearing a gray and red 'Canada' baseball cap with a coordinating bowtie. He has also selected a red and black Tissot watch for this special day. 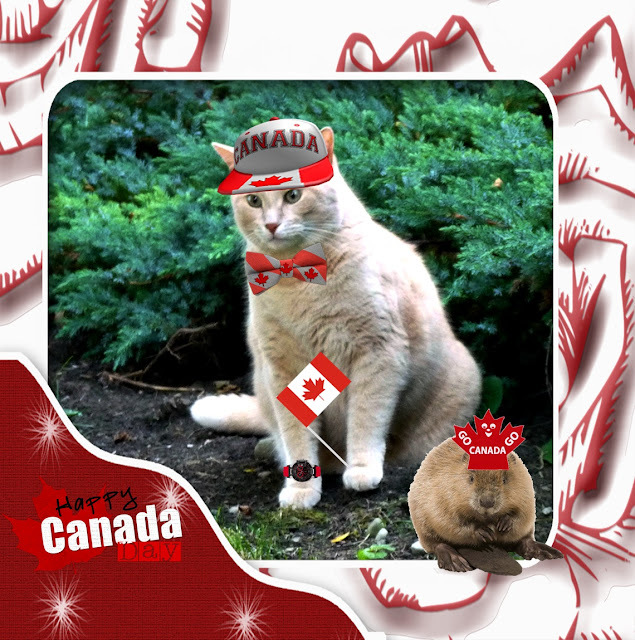 Dylan's friend is a Canadian beaver who is wearing his own pro-Canada hat in the shape of a maple leaf. When a beaver likes something, they really 'Go' for it (eager beaver and all that), and this beaver loves his country more than anything. "Chip, chip hooray!" shouts the beaver. "Wood chips, dat is." Domino is relaxing today and really taking it easy. She went all out on her Canada Day outfit, however. 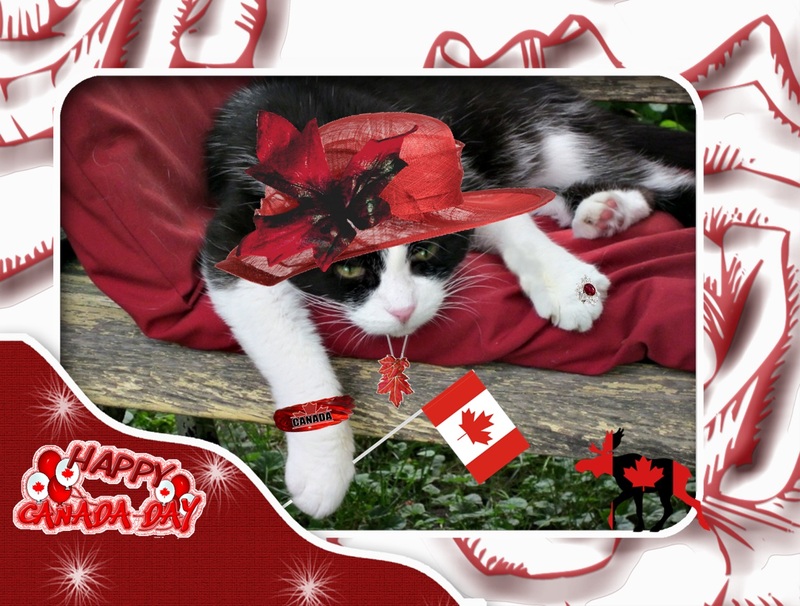 She is wearing a red broad-brimmed summer hat adorned with a large red and black maple leaf. Her necklace, too, is a cluster of maple leaves, and her red bracelet is emblazoned with yet another maple leaf and the word "Canada". Domino is happy to introduce her friend -- the Canadian Moose. The moose is another proud standard bearer of the Canadian flag. 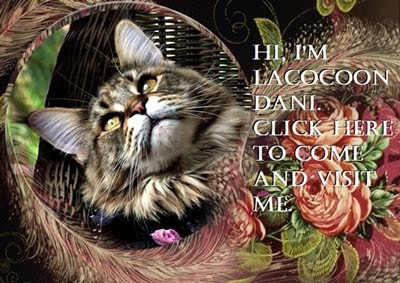 To many this animal is still quite moosterious as few have actually encountered one in the wild. "I has a true moose-story to tell yoo" says he. "It's a tale of survival under da harshest conditions." Y'all look quite festive! Happy Canada Day to all our Canadian pals!